There is nothing horrible about what I eat. The foods are mostly things my great grandparents would have eaten if anyone in my family ever ate vegetables. The items in red have some sort of processing in their getting from nature to table, so they are not permitted today. Breakfast was easy: Two poached eggs and 2 additional cooked whites. They started in the shell and were cooked by me. No salt because the salt has salt and four additional ingredients on the label. I also had a whole banana, fresh kale and half an avocado. 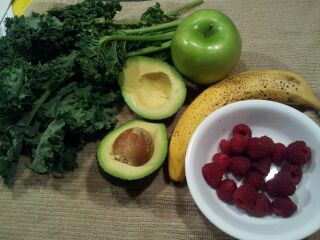 No Splenda, almond milk, or Greek yogurt - all of which I would have added to the kale and banana. To make it a little wet I added 1/2 cup of fresh raspberries so it blended well into a puree. Breakfast was 22 grams fat (darn those egg yolks), 26 grams protein and 49 grams carbs. Lunch: whole sweet potato. 1 oz of nuts I cracked open myself and 1/4 cup of fresh blackberries. Then I had a whole carrot. Didn't eat the green top. Strangely, I was not hungry for lunch and don't feel like eating my planned afternoon snack, so I moved the calories into dinner. Dinner was a salad of half avocado, a yellow squash, 1 tomato, quinoa, juice of 2 key limes (fresh), home grown cilantro, a carrot, four egg whites and one red pepper (sweet, not hot). It was tasty - even without salt, vinegar, pepper, seasonings, sauces, oil, meat, cheese or poultry. Protein is much lower than normal (for me) on this plan. I usually have 35% to 40% of my calories from protein and 23% to 27% from fat. The rest from carbs. Today the protein is under 20%. Someone pointed out to me that water has chemicals, too. True, but not the point of this exercise. I have no power over the water supply or how many of the fresh vegetables or fruits I eat are grown. All I can control is what I put in my mouth after I read a label. Today I did not eat things just because they are edible. I ate pure food. I could do it again. I could do it if I had. I am grateful that tomorrow I can have my yogurt, ham, coffee and almond milk. I thought your list yesterday was your unprocessed food list!! LOL. So why no animal protein other than eggs? Glad you are going back to regular. Cows are fed a corn diet which is not their natural food (and it makes them sick and that is why there are antibiotics in the milk and meat) - so no beef. Fish that are farm raised - same unnatural food. However I would have eaten a wild caught ocean fish IF I had purchased one whole - which is did not. Chicken, unless it was whole and not yet treated and frozen, is processed. I have never wanted to even think about being a vegan but just writing these reasons for not having these things for 1 day makes me wonder about it - a little. I've the been purchasing the grass fed grass finished beef ( trader Joe's) , bison burgers and bison flank steaks ( costco)for the red meats that I purchase. I don't eat it often due to the price. Organic chicken and turkey or the smaller grocer ( locall) sources. And I've switched over to organic eggs ( costco. ). Good to think of the sources of protein and pick foods that are eating more of a natural diet. I know that by sourcing my protein from the right places that I'm getting a lot more omega 3's and my blood work shows it. Good lipid panels and low CRP. Low blood pressure and very best of all , the protein is a key part of weight maintenance. Good luck! I feel sooo much better limiting my processed foods.